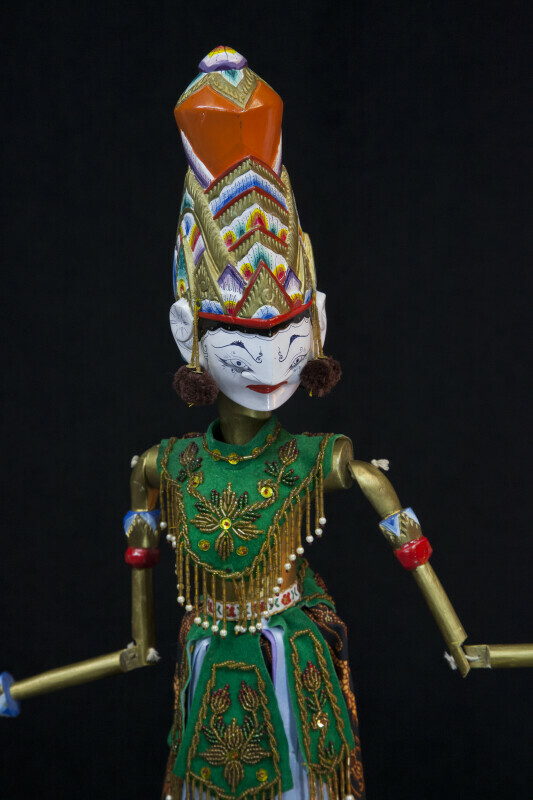 Wooden rod puppet (wayang golek) of Rama, the hero of the Hindu legend called Ramayana. The doll puppet is manipulated by a bamboo rod that runs through the center of the body, as well as smaller rods connected to the puppet's hands. A puppeteer (dalang) controls the doll by using the rods to turn the head and move the jointed arms (which are connected with strings). The Rama doll is made entirely from wood and is wearing a velvet sarong embellished with beads, sequins, and gold applique. Below the puppet's waist, a sarong type batik skirt hides the puppeteer's hands. His head and majestic crown are three-dimensional, carved and hand painted. He has tassels hanging on either side of her crown. The figure is 27 inches (69 cm) tall.